...know this and you can play to win the game! Will you be playing in a game if you don't know what the rules are? Unlikely, right?Well, the performance management or appraisal system is very similar. 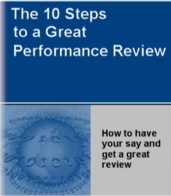 Understanding performance review rules will enable you to have a better chance of winning! Overall process - a good place to start understanding performance review is byunderstanding how the overall process works. Does your company use a 360 performance review system or a more traditional system? In some companies this is very clear and transparent so it is easy to follow. If it is not, then start with your manager. Ask them to describe to you how the overall appraisal works and the key steps in the process. If your manager cannot describe this then you should be concerned. Good managers should know this process well. You could also ask your Human Resources representative for clarification. Linkages - the process of conducting the review or the performance appraisal is usually not a stand-alone activity but connected to other people process activities in a well designed system. By understanding performance review linkages to other processes you will have a better appreciation of the relationships and implications. For example, you set objectives at the start of the year and establish an employee development plan to help you meet the objectives. Then have a follow-up review with your manager during the year followed by your final performance review. This then impacts on your compensation such as pay increases, bonus, etc. Your performance data can also be used for aspects of your career growth and development. So, if you are aware of this big picture and can see the completed puzzle you will have a better understanding of how the whole system works together and how to make it work for you. Your role - it is best to clarify this early on. You understanding performance review roles and responsibilities is key. What is your role in the appraisal process? Do you get to have a say in this by writing your performance review or is it completely done by yourmanager? Or, is it a joint process where you and your manager work together to completethe review? And, who does what? Again, asking these questions will put you in a betterposition to know the rules of the game and go for the win. Your manager or Human Resourcesrepresentative should be able to answer these questions. What if you cannot have your say - good performance management systems aredesigned so you canhave your say. But, what if the system does not allow for that? Well, this is where alittle creativity and persuasion comes in on your part. Understanding performance reviewprocess, linkages and roles as explained above will make you more creative. Here are someideas. You can write up a list of your achievements throughout the year. You can reflecton how you think you went against your objectives and career plan, and write down what you learnt, what your challenges were and how you overcame them, and your views on how to do even better in the job. You can talk about how you closed your competency gaps using a variety of career development techniques and how they helped you improve your performance and overall image. You can also collect customer inputs and write up all the good things they have said about you. Once you have done this you can arrange for an informal discussion with your manager and give them a copy of your notes. Preface it by saying that these are your thoughts as you reflected on your performance during the year and they may be of use as your manager prepares for the performance review. Guess what? Most managers do not drool over writing performance reviews and I bet you they are going to take a look at your notes and use some of them! And, you have just found a way to have your say even if the rules did not allow for it. You can now see how understanding performance review process helps you create new rules to win the game! Forms - performance reviews are usually documented so forms become an integral part of the process. Find out what forms to use or the links for a 360 performance review. Get the latest version as theychange over time and find out which parts you have to complete. If you are new to this thenask for a sample so you have a better idea of what goes where. Also, find out if what youwrite is draft or final. You can change a draft and provide further input later on butif it is final and once you write it up that's it. Timeline - understanding performance review timelines is another importantaspect of the preparation process. This is where you find out the exact steps of theprocess, the tasks involved and the dates associated with it. Each activity may have astart and finish date along with deadlines. If your manager has many subordinates then itwill be in your interest to get your review in early rather than rush at the end wheneveryone else is trying to get theirs in. It will also be easier for you to arrange for aninformal discussion with your manager early in the process than at the end. So, it pays tounderstand this and work the system to your advantage. Previous - what you want from your review. Next - what data to collect.